FirebaseUI is an open-source library that offers simple, customizable UI bindings on top of the core Firebase SDKs. It aims to eliminate boilerplate code and promote best practices (both user experience and security) for authentication. A simple API is provided for drop-in user authentication which handles the flow of signing in users with email addresses and passwords, phone numbers, and federated identity providers such as Google Sign-In, and Facebook Login. It is built on top of Firebase Auth. The best practices embodied in FirebaseUI aim to maximize sign-in and sign-up conversion for your app. It integrates with Smart Lock for Passwords to store and retrieve credentials, enabling automatic and single-tap sign-in to your app for returning users. It also handles tricky use cases like account recovery and account linking that are security sensitive and difficult to implement correctly using the base APIs provided by Firebase Auth. FirebaseUI auth can be easily customized to fit with the rest of your app's visual style. As it is open source, you are also free to modify it to exactly fit your preferred user experience. Equivalent FirebaseUI auth libraries are also available for iOS and Web. In order to use either Google, Facebook or Twitter accounts with your app, ensure that these authentication methods are first configured in the Firebase console. FirebaseUI client-side configuration for Google sign-in is then provided automatically by the google-services gradle plugin. If support for Twitter Sign-in is also required, define the resource strings twitter_consumer_key and twitter_consumer_secret to match the values of your Twitter app as reported by the Twitter application manager. In addition, you must enable the "Request email addresses from users" permission in the "Permissions" tab of your Twitter app. WARNING: GitHub OAuth is not for the faint of heart. Getting it setup correctly is an invested process and may take a half-hour or two. Ready? Let's begin. GitHub requires that override redirect URIs only extend the base URI configured in the dashboard for security reasons. What does this mean? For GitHub auth to work on the web, the full https://project-id.firebaseapp.com/__/auth/handler redirect URI must be specified, thus preventing us Android devs from using a custom scheme (since we can only extend the base URI with extra path elements). As a side note, if you don't care about Web or iOS support, you can simply override our GitHubLoginActivity's intent filters with your custom scheme to skip all these steps... However, this will make adding support for Web or iOS difficult should you decided to do so in the future—hence us not officially support this method. Protip: you might as well also grab the release SHA-1 hash and the debug hashes to add them to the Firebase Console since they're useful in other contexts. Also, adding debug hashes will let you test all this without having to use a release build. If you're already using Firebase Hosting, give yourself a pat on the back and move on. Otherwise, read on! Go through this tutorial and make sure to say no when asked to redirect everything to a single page. If you're already doing that, exclude .well-known/assetlinks.json. Congrats, you did it! All that's left to do is kick off the sign-in flow. In all likelihood, your asset links aren't configured correctly. Make sure that https://project-id.firebaseapp.com/.well-known/assetlinks.json resolves without redirects. If all else fails, FUI team members will help you out on StackOverflow with the FirebaseUI tag. The entry point to the authentication flow is the com.firebase.ui.auth.AuthUI class. If your application uses the default FirebaseApp instance, an AuthUI instance can be retrieved simply by calling AuthUI.getInstance(). If an alternative app instance is required, call AuthUI.getInstance(app) instead, passing the appropriate FirebaseApp instance. If a user is not currently signed in, as can be determined by checking auth.getCurrentUser() != null (where auth is the FirebaseAuth instance associated with your FirebaseApp), then the sign-in process can be started by creating a sign-in intent using AuthUI.SignInIntentBuilder. A builder instance can be retrieved by calling createSignInIntentBuilder() on the retrieved AuthUI instance. The set of authentication providers can be specified. The terms of service URL for your app can be specified, which is included as a link in the small-print of the account creation step for new users. If no terms of service URL is provided, the associated small-print is omitted. A custom theme can be specified for the flow, which is applied to all the activities in the flow for consistent colors and typography. To kick off the FirebaseUI sign in flow, call startActivityForResult(...) on the sign in Intent you built. The second parameter (RC_SIGN_IN) is a request code you define to identify the request when the result is returned to your app in onActivityResult(...). See the response codes section below for more details on receiving the results of the sign in flow. To use email link sign in, you will first need to enable it in the Firebase Console. Additionally, you will also have to enable Firebase Dynamic Links. You can enable email link sign in by calling the enableEmailLinkSignIn on an EmailBuilder instance. You will also need to provide a valid ActionCodeSettings object with setHandleCodeInApp set to true. Additionally, you need to whitelist the URL you pass to setUrl; you can do so in the Firebase Console (Authentication -> Sign in Methods -> Authorized domains). We support cross device email link sign in for the normal flows. It is not supported with anonymous user upgrade. By default, cross device support is enabled. You can disable it by calling setForceSameDevice on the EmailBuilder instance. When using the phone verification provider and the number is known in advance, it is possible to provide a default phone number (in international format) that will be used to prepopulate the country code and phone number input fields. The user is still able to edit the number if desired. Alternatively, you can set the default country (alpha-2 format) to be shown in the country selector. It is also possible to set a default country code along with a national number if a specific country is your app's target audience. This will take precedence over the full default phone number if both are provided. You can limit the countries shown in the country selector list. By default, all countries are shown. You can provide a list of countries to whitelist or blacklist. You can populate these lists with ISO (alpha-2) and E164 formatted country codes. All countries with the country code +1 will be present in the selector as well as Greece ('gr'). You may want to exclude a few countries from the list and avoid creating a whitelist with many countries. You can instead provide a list of countries to blacklist. By doing so, all countries excluding the ones you provide will be in the selector. The country code selector will exclude all countries with a country code of +1 and Greece ('gr'). Note: You can't provide both a list of countries to whitelist and blacklist. If you do, a runtime exception will be thrown. This change is purely UI based. We do not restrict users from signing in with their phone number. They will simply be unable to choose their country in the selector, but there may be another country sharing the same country code (e.g. US and CA are +1). The authentication flow provides several response codes of which the most common are as follows: Activity.RESULT_OK if a user is signed in, Activity.RESULT_CANCELED if the user manually canceled the sign in, ErrorCodes.NO_NETWORK if sign in failed due to a lack of network connectivity, and ErrorCodes.UNKNOWN_ERROR for all other errors. Typically, the only recourse for most apps if sign in fails is to ask the user to sign in again later, or proceed with anonymous sign-in if supported. Alternatively, you can register a listener for authentication state changes; see the Firebase Auth documentation to get the currently signed-in user and register an AuthStateListener). Note: if you choose to use an AuthStateListener, make sure to unregister it before launching the FirebaseUI flow and re-register it after the flow returns. FirebaseUI performs auth operations internally which may trigger the listener before the flow is complete. To retrieve the ID token that the IDP returned, you can extract an IdpResponse from the result Intent. Twitter also returns an AuthToken Secret which can be accessed with idpResponse.getIdpSecret(). // The user is new, show them a fancy intro screen! // This is an existing user, show them a welcome back screen. If a user is not currently signed in, then a silent sign-in process can be started first before displaying any UI to provide a seamless experience. Silent sign-in uses saved Smart Lock credentials and returns a successful Task only if the user has been fully signed in with Firebase. // Ignore any exceptions since we don't care about credential fetch errors. The user must be signed out of the FirebaseAuth instance. 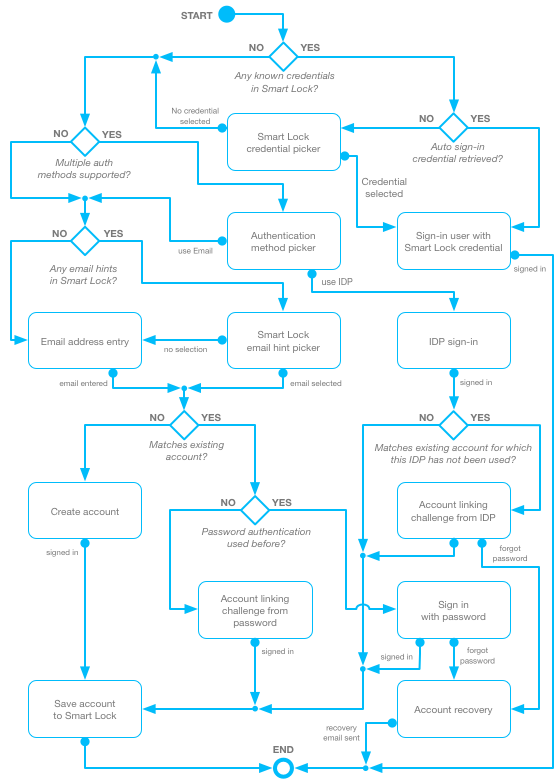 Smart Lock for Passwords must be instructed to disable automatic sign-in, in order to prevent an automatic sign-in loop that prevents the user from switching accounts. If the current user signed in using either Google or Facebook, the user must also be signed out using the associated API for that authentication method. This typically ensures that the user will not be automatically signed-in using the current account when using that authentication method again from the authentication method picker, which would also prevent the user from switching between accounts on the same provider. The user must be deleted from Firebase Auth. Smart Lock for Passwords must be told to delete any existing Credentials for the user, so that they are not automatically prompted to sign in with a saved credential in the future. When an anonymous user signs in or signs up with a permanent account, you want to be sure that the user can continue with what they were doing before signing up. For example, an anonymous user might have items in their shopping cart. At check-out, you prompt the user to sign in or sign up. After the user is signed in, the user's shopping cart should contain any items the user added while signed in anonymously. To support this behavior, FirebaseUI makes it easy to "upgrade" an anonymous account to a permanent account. To do so, simply call enableAnonymousUsersAutoUpgrade() when you configure the sign-in UI (this option is disabled by default). There is an issue when an anonymous user tries to upgrade to an existing Firebase user. For example, a user may have previously signed up with a Google credential on a different device. If they are signed in anonymously and they attempt to upgrade with the existing Google account, a FirebaseAuthUserCollisionException will be thrown by Firebase Auth as an existing user cannot be linked to another existing user. No two users can share the same credential. In this case, we need to merge the data from both users before we can upgrade the anonymous user. The process of storing the anonymous users data, signing in with the credential, and copying the data over to the existing account is left to the developer. When linking is unsuccessful due to user collision, an error with code ErrorCodes.ANONYMOUS_UPGRADE_MERGE_CONFLICT will be returned to onActivityResult(). A valid non-anonymous credential can be obtained from the IdpResponse via getCredentialForLinking(). To use FirebaseUI Auth's sign-in flows, you must provide an app_name string and use the AppCompat color attributes in your app. Your application theme could also simply be used, rather than defining a new one. The first screen shown in most cases is the auth method picker screen, where the user selects from a list of authentication methods. While customization in other screens of FirebaseUI is limited to themes, this screen can be fully customized with your own XML layout. // that you have enabled. Note: String resource names aren't considered part of the public API and might therefore change and break your app between library updates. We recommend looking at a diff of the strings.xml file before updating FirebaseUI. By default, FirebaseUI requests the email and profile scopes when using Google Sign-In. If you would like to request additional scopes from the user, call setScopes on the AuthUI.IdpConfig.GoogleBuilder when initializing FirebaseUI. By default, FirebaseUI requests the email and public_profile permissions when initiating Facebook Login. If you would like to request additional permissions from the user, call setPermissions on the AuthUI.IdpConfig.FacebookBuilder when initializing FirebaseUI. Twitter permissions can only be configured through Twitter's developer console. By default, FirebaseUI requests the user:email permission when performing OAuth. If you would like to request additional permissions from the user, call setPermissions on the AuthUI.IdpConfig.GitHubBuilder when initializing FirebaseUI.